Japanese tansu are available in many shapes, sizes and uses. Made up of a combination of drawers and sliding doors, tansu were designed to accommodate a variety of different uses. For example, ishodansu stored clothing, a chobadansu stored documents while a chadansu stored implements for tea ceremony and a kaidansu had drawers for storage but was primarily used as a stairsteps to an upper level. While the size and positioning of the doors and drawers vary among these different tansu, they hold in common clean lines and asymmetry. With a focus on utility, many of these chests are stackable and most have metal side handles so they can be easily moved. 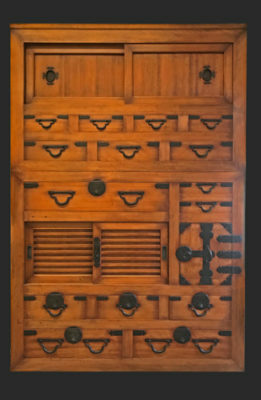 We have a large inventory of all sizes and types of tansu chests, so please contact us with your preferences and we will help you find one that fits your needs. Here are examples of different types of tansu chests. The pieces pictured may not be available, please see the category pages for items currently in stock.